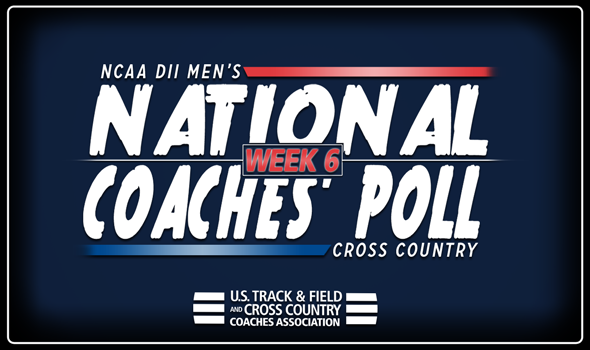 NEW ORLEANS – Despite a handful of great races this past weekend, including the Rock Pre-Nationals and the Western Washington Classic, there wasn’t much change to the latest edition of the NCAA Division II Men’s Cross Country National Coaches’ Poll released by the U.S. Track & Field and Cross Country Coaches’ Association (USTFCCCA) on Wednesday. While the majority of the country was taking to the course for a final tuneup many of the top programs in the national poll used the weekend to rest instead of competing to get ready for conference championships that will take place in NCAA DII between November 2-4. For the seventh consecutive poll, the men from Adams State remained at No. 1 after once again collecting all eight first-place votes. The run at the top to open the season bests the six-week mark the Grizzlies posted last year and is just one week short from matching an eight-week run to start the 2014 campaign. Adams State was off from competition and last raced its B-Team to a four-place finish at the Fort Hays State Tiger Open on October 13. The program will next race again at the Rocky Mountain Athletic Conference Championships set for November 3. Colorado Mines improved one spot to move back into the No. 2 position after picking up the team title at the Rock Pre-Nationals with an impressive 19-point performance. Grant Colligan took home the individual crown and the Orediggers placed all five of their scoring athletes in the top-eight of the race. Colorado Mines will meet up with Adams State and other top-ranked teams for its next race at the Rocky Mountain Athletic Conference Championships on November 3. Grand Valley State dropped one to No. 3 after an off-week from competition. The Lakers last raced at the Bradley Pink Classic on October 12 and will go again at the Great Lakes Intercollegiate Athletic Conference Championships on November 3. Chico State remained steady in the No. 4 spot after picking up a win at UC San Diego’s Triton Classic over the weekend. The Wildcats were paced by individual champion Wyatt Baxter and placed eight athletes in the top-8 of the race. The meet served as a final tuneup for Chico State before the California Collegiate Athletic Association Championships on November 3. Western State also experienced no change to hold in the No. 5 spot. The Mountaineers are fresh off a win at its 68th Annual W Mountain Run in which the group was led by individual champion Kyle Lewis. Next up will be the Rocky Mountain Athletic Conference Champions on November 3. No. 6 Augustana (S.D.) jumped up one spot after taking second at the Mount Marty Invite this past weekend. The Vikings were led by Henry Klitzke who came in 10th overall as an individual. Augustana returns to the course with the running of the Northern Sun Intercollegiate Conference Championships on November 3. Trading spots with Augustana was No. 7 Queens (N.C.) despite the Royals racing to a tie for second at the Rock Pre-Nationals Nick Kipkemei led the way for Queens with a 13th-place finish. The group will go again at the South Atlantic Conference Championships on November 3. No. 8 belonged to Simon Fraser after the Clan won the Western Washington Classic over the weekend with a 40-point performance. Rowan Doherty placed fourth to finish as the top athlete for the program who had all five scoring athletes come in the top-18 at the meet. Simon Fraser will be back in action with the Great Northwest Athletic Conference Championships on November 3. No. 9 Mount Olive also saw no change from the previous ranking as the group tied with Queens for second at the Rock Pre-Nationals. Tai Smith led the way in ninth as the program recorded 126 points. The Trojans will run next at the Conference Carolinas Championships on November 3. It total 18 of the previous top-25 ranked teams had some kind of movement but it wasn’t as much as some might have expected. Of the 18 four of the teams saw an improvement while 12 experienced some kind of drop in the standings. There were also two new programs to the poll as No. 11 Alaska Anchorage and No. 17 Cedarville went from being unranked teams to moving into the top-25 this week. It was the highest mark received for Alaska Anchorage since the opening weeks of the 2017 season while it was the best rank received by Cedarville since 2014. The biggest improvement from a previous ranked squad belonged to No. 18 Malone who shot up three spots this week. It was the highest rank received by Malone this season and its best since 2014. UNC Pembroke, Southern Indiana, West Texas A&M, Embry-Riddle (Fla.), Southern Connecticut and Shippensburg also received votes.